Big Trouble in Little China (also known as John Carpenter's Big Trouble in Little China) is a 1986 American martial arts film directed by John Carpenter. 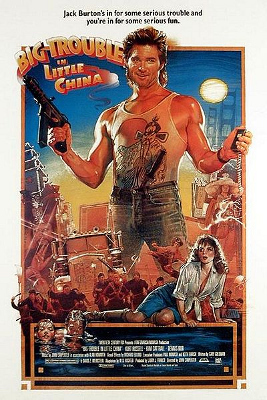 It stars Kurt Russell as truck driver Jack Burton, who helps his friend Wang Chi (Dennis Dun) rescue Wang's green-eyed girlfriend (Suzee Pai) from bandits in San Francisco's Chinatown. They go into the mysterious underworld beneath Chinatown, where they face an ancient sorcerer named Lo Pan (James Hong). Although the film was originally envisioned as a Western set in the 1880s, screenwriter W. D. Richter was hired to rewrite the script extensively and modernize everything. The studio hired Carpenter to direct the film and rushed Big Trouble in Little China into production so that it would be released before a similarly themed Eddie Murphy film, The Golden Child, which was slated to come out around the same time. The project fulfilled Carpenter's long-standing desire to make a martial arts film. Big Trouble... was a commercial failure, grossing $11.1 million in North America and well below its estimated $25 million budget. It received critically mixed reviews that left Carpenter disillusioned with Hollywood and influenced his decision to return to independent film-making. It has become a cult film due to its success on home video.